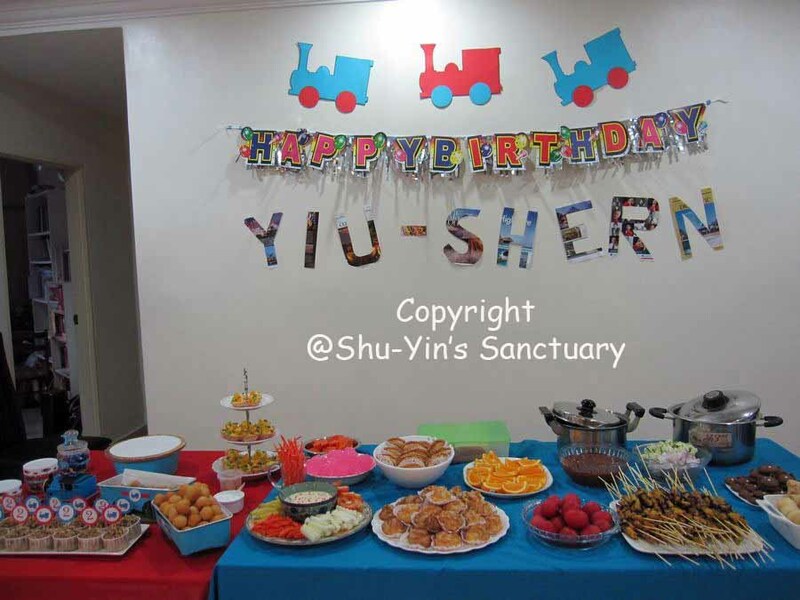 Shu-Yin's Sanctuary: Shern's 2nd Birthday Party!!! Finally a blog post about Shern's 2nd birthday party! A lot of preparation needs to be done for Shern's 2nd Birthday Party. And I'm the only one doing everything because I don't have money to hire a party planner. Hehe. 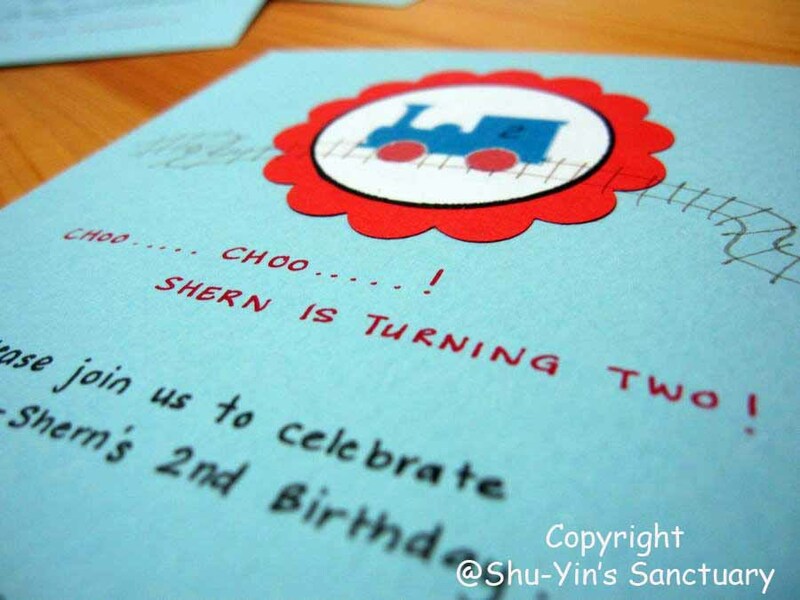 The invite is handwritten by me! Ahem. 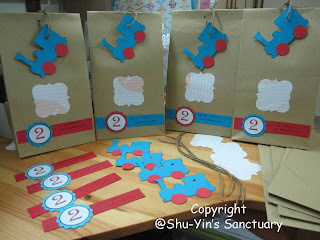 Next, I need to source for stuff to be put inside the Party Packs. I printed some train worksheets from the internet and made a small booklet out of them. (I got it from http://homeschooling.about.com). Put in a crayon and a pencil. 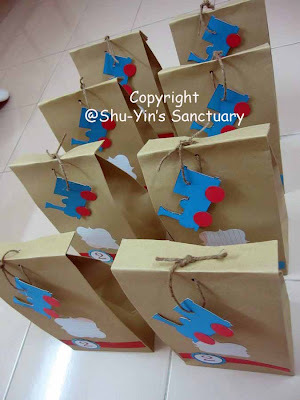 I then kinda customize the Party Packs favours according to age and gender. Bigger kids get a pencil box with pencils and rulers inside. Older girls even get a cute ring and a necklace. Toddlers get squishy rubbery toys and etc. And some healthy snacks such as raisins and cereal bars. And then I got down to making the Party Packs myself. 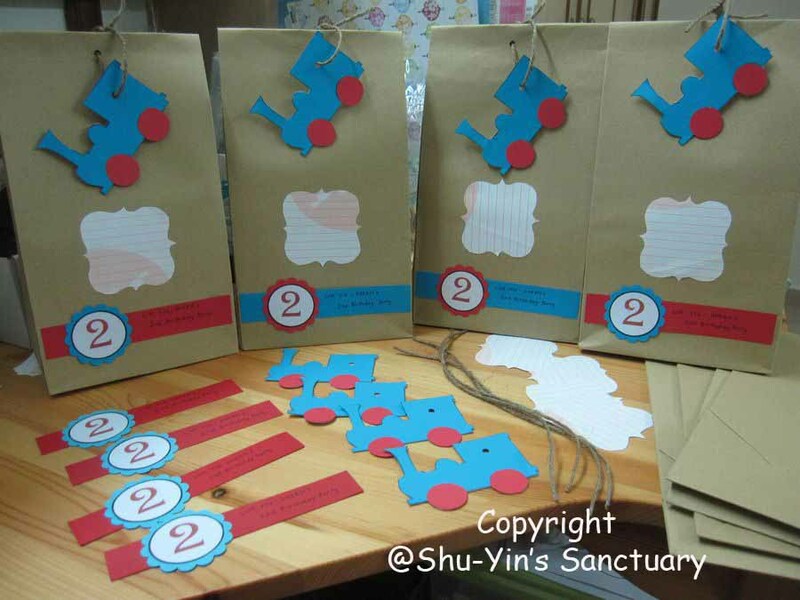 See...so much work is involved to make a theme coordinated bags. And I cut those train tags myself 'til I was so sick of trains. Haha. But I'm pleased with myself with the final product. 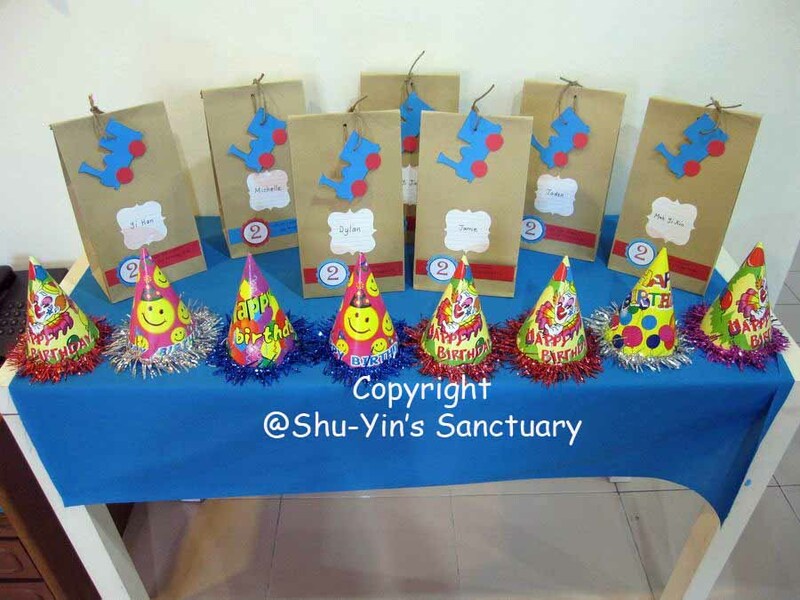 This is how the Party Pack table looks like. Bought the cheap blue cloth from Kamdar for RM2.80 per meter. 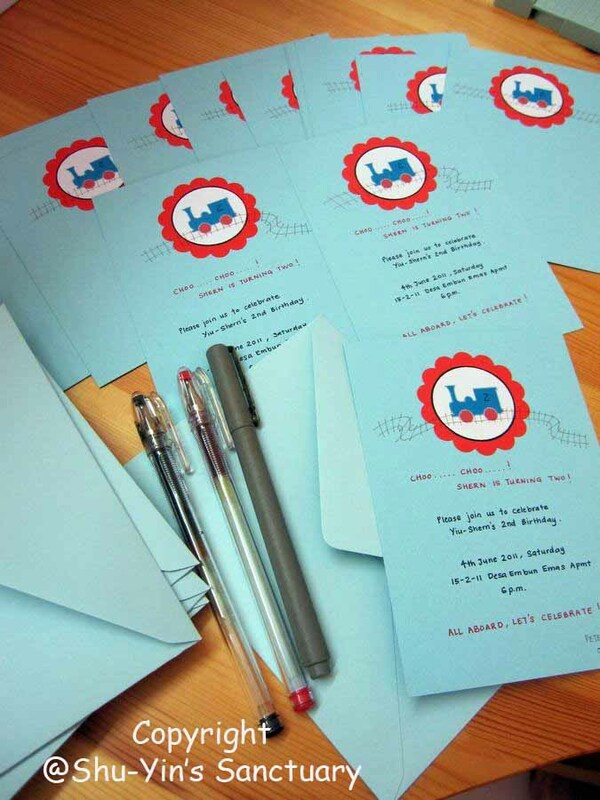 Cheap and really nice and coordinating to my Red and Blue Train Theme Party! This is the deco wall. 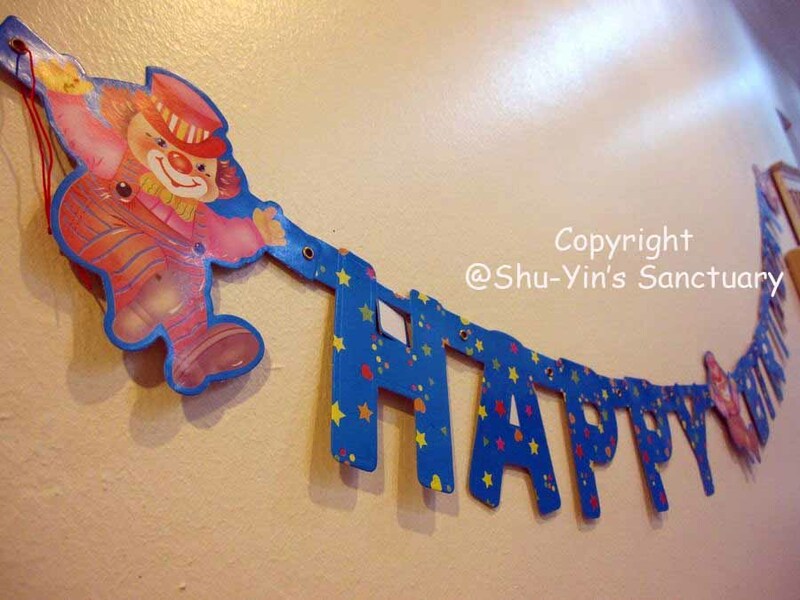 The 'Happy Birthday' wording is from Young Ones RM4.90. 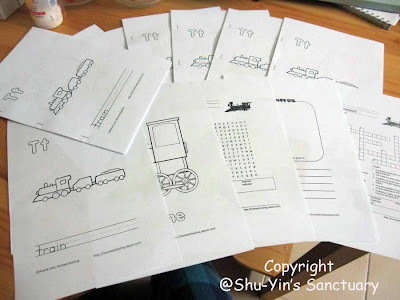 These bigger sized trains I enlarged them and cut them out. 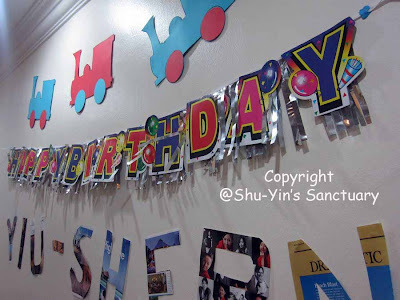 'Lim Yiu-Shern' is cut freehand by Shu-Min using old magazines. Another mini 'Happy Birthday' tag from Young Ones. 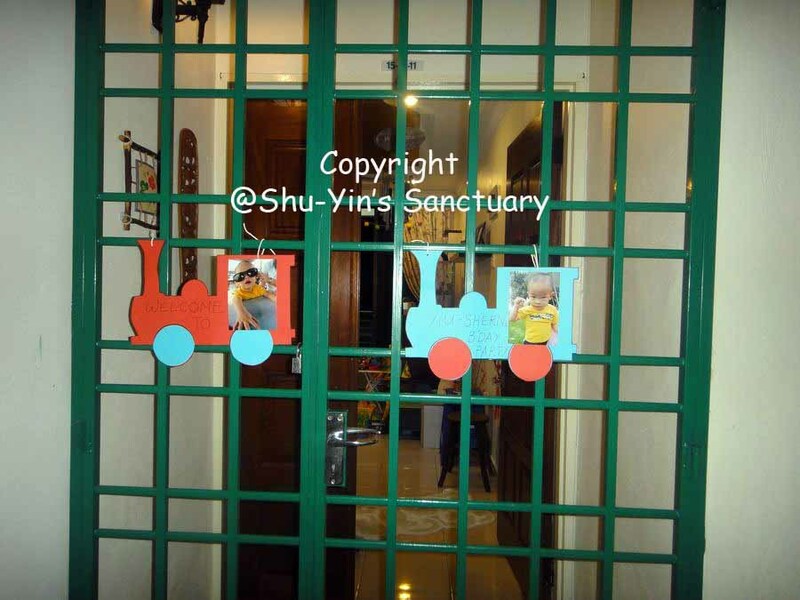 Cut out 2 more trains and tied them to the front door. 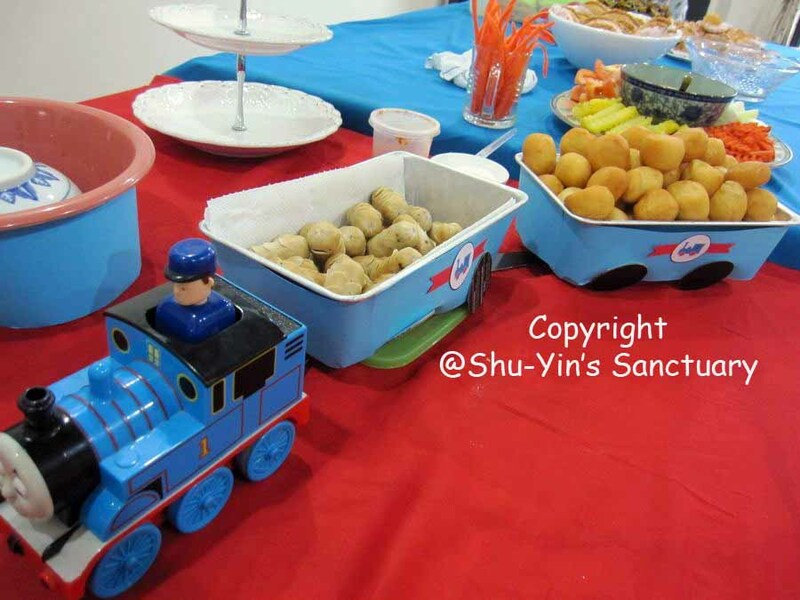 I also made some train-designed tenders using my baking tray wrapped in blue paper. 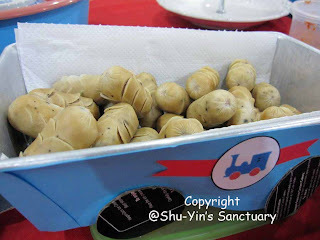 Cut wheels our for them and they hold mini donuts and mushroom sausages. This is how the train and tenders look like. I also made some cupcake toppers (for this erm..shd be muffin toppers)! I like how it turns out! They really brighten up the desert table! What is a birthday party without the must-have red eggs, right? 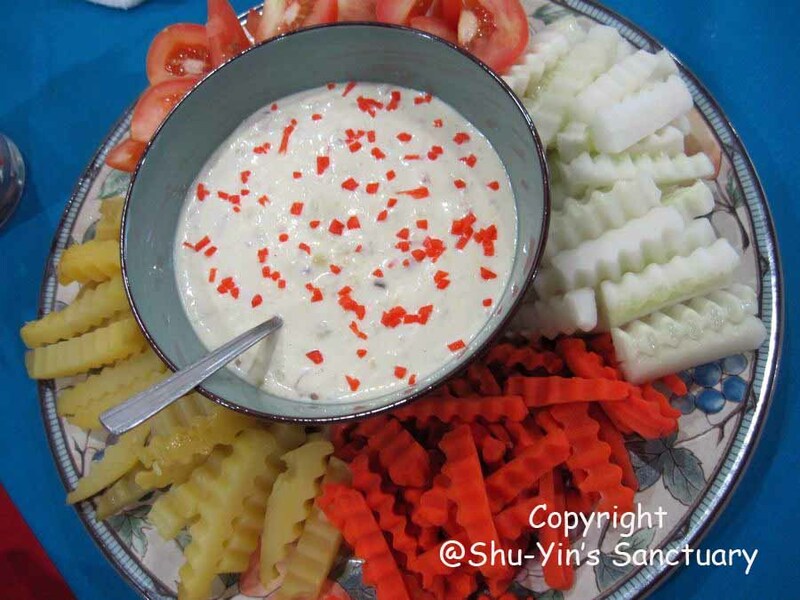 Mum made this delicious healthy dish with a really delish dip! 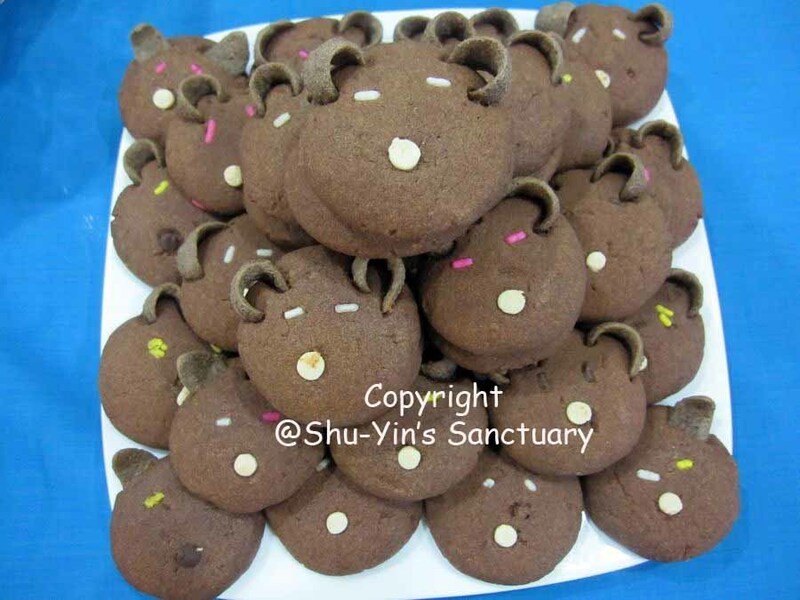 Ordered these cookies. I love how cute they are and is most suitable for a kid's birthday party! One of my favourite desert. 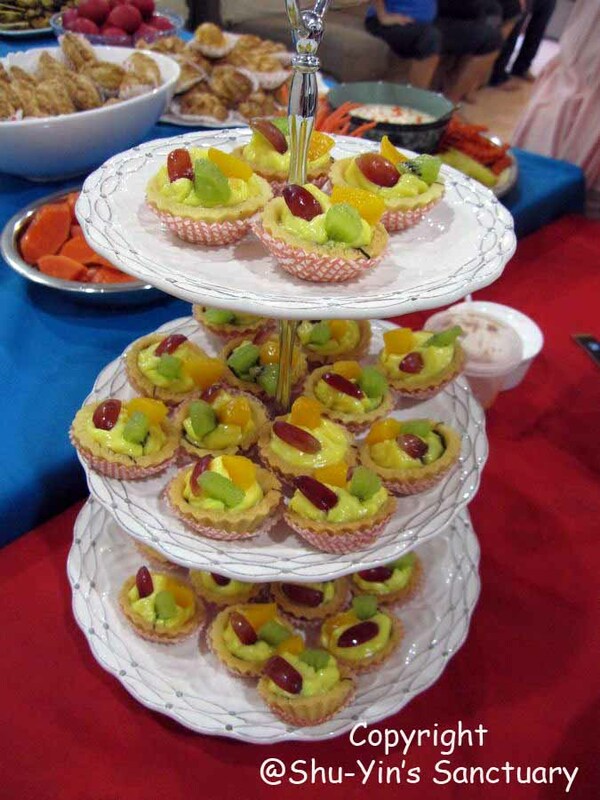 Fruit tarts being displayed on the 3-tier-stand! There are many other dishes of course. 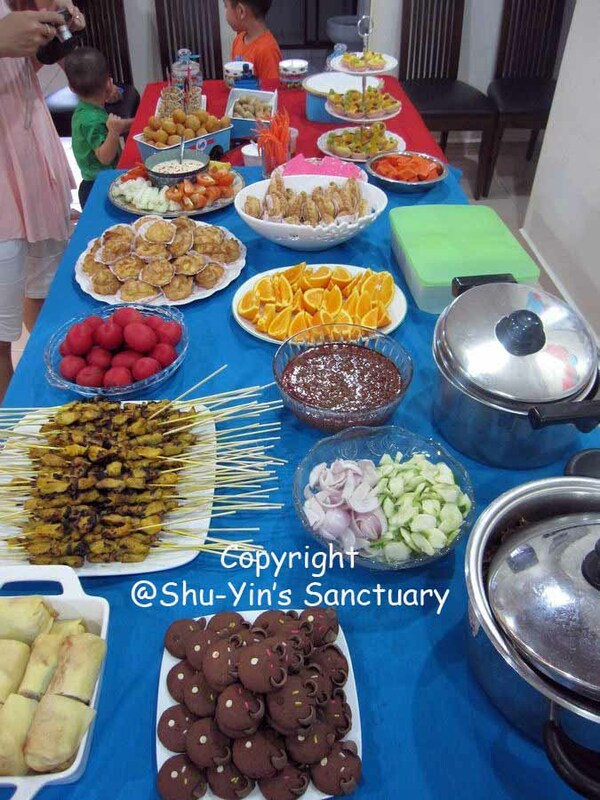 Curry chicken, satay, curry puffs, tuna sandwiches, cream puffs, egg rolls, fruits and jelly, etc. This is the food spread for 30 ppl of mostly relatives and some close friends! Haha, more than enough, I know. Well, more is better than not enough at a party, right? 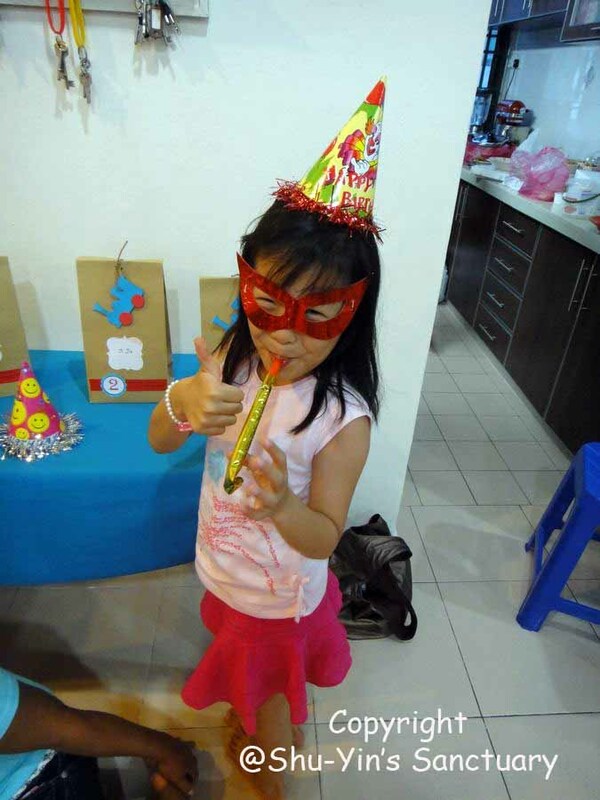 Jamie digging out her Party Pack goodies! I bought the cake plain and we designed it ourselves. You can read about the cake here. It's an awesome one-of-a-kind CHOO CHOO birthday cake for Shern! 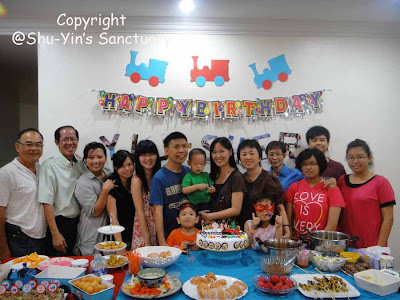 A group photo with my side of the family. A group photo with hubby's side of the family. 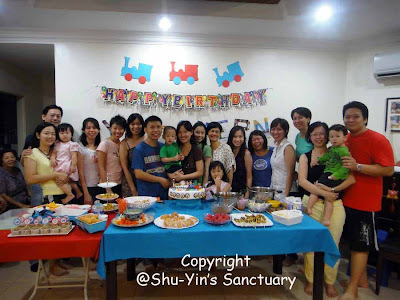 Group photo with the Mah Family. Lastly a group photo with friends. We took a video of us singing the birthday song. The reaction of Shern when we asked him to blow the candles was hilarious. 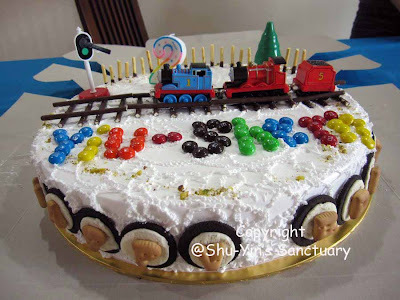 He kept saying 'oh oh...because James the Tank Engine displayed on the cake was sinking'. Haha. And he stole the Thomas The Tank Engine. He was holding it in his hands. 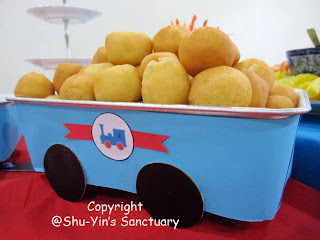 I need to steal it from the cake to give him to pacify him from being overexcited, and so that he cooperate to be good for singing session and cake cutting session! Haha. 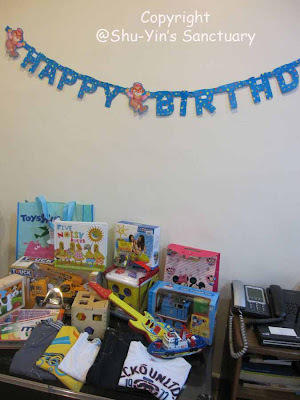 Thank you all for your lovely presents and angpows and thank you very much for attending. The last guests left at around 9pm++ and we clean up and by the time I finished, it was 1am! It was a tiring day. But I had fun. And I'm glad it was a success! hi! very nice theme. 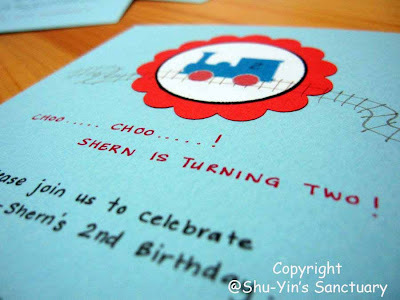 My daughter is turning 2 this august. 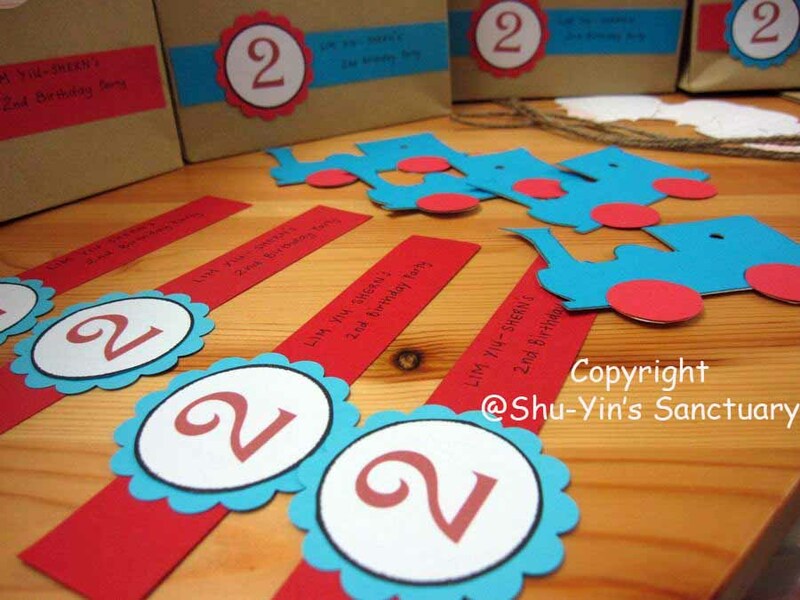 Donno if i can work as hard as u in preparing for the birthday party. good job. Rin, welcome to my blog. Yes, the preparation needs work and time. And most of the stuff I do at night after my son is asleep. Happy bday to your daughter soon and good luck in your party planning! A true effort of love. My favourite was the Train Trays filled with food. A very creative improvisation. Wendy...thanks. 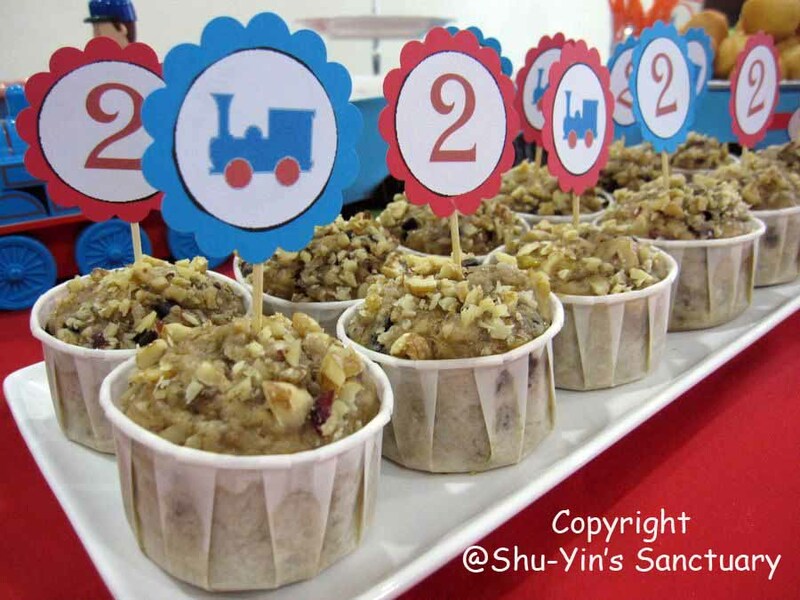 I got this inspiration when I saw fr the internet that they actually have this kind of train plate mould. They costs a bomb of course. 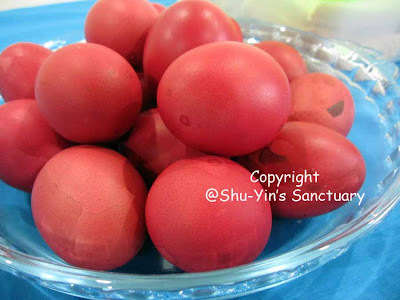 And I decided to make it myself, with very minimal costs. 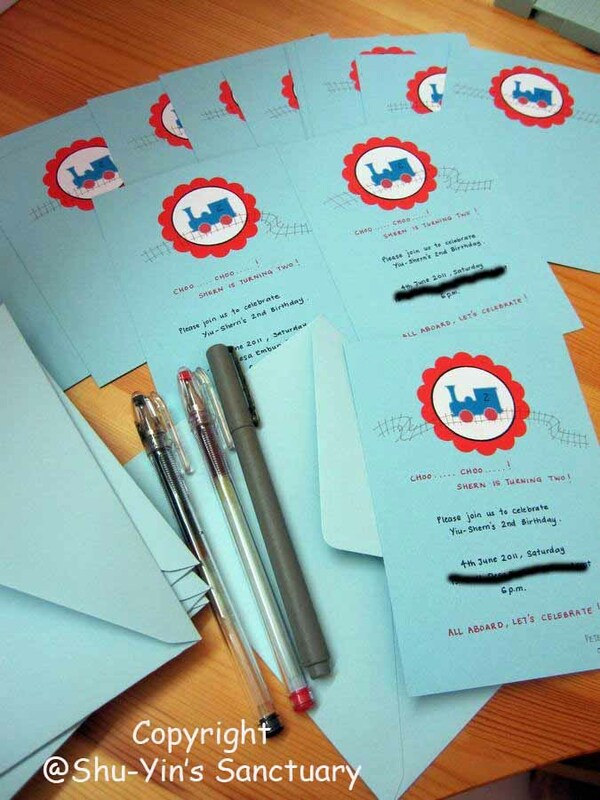 Just a blue paper to wrap up the baking trays. 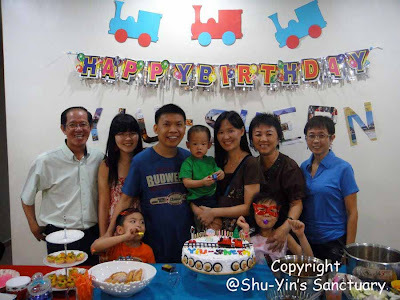 The black wheels is actually from the haagen-dazs cake cardboard fr my bday earlier this yr. Yes, I keep rubbish! Hehe! I did not make most of the food. I ordered most of them. I just did the deco myself. 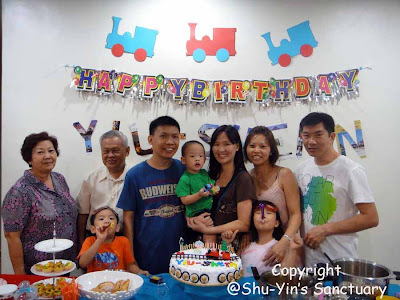 This mummy create the best baby birthday party ever and till now I have no time or energy to do one for my son. Way to go mummy Shern...you the best. 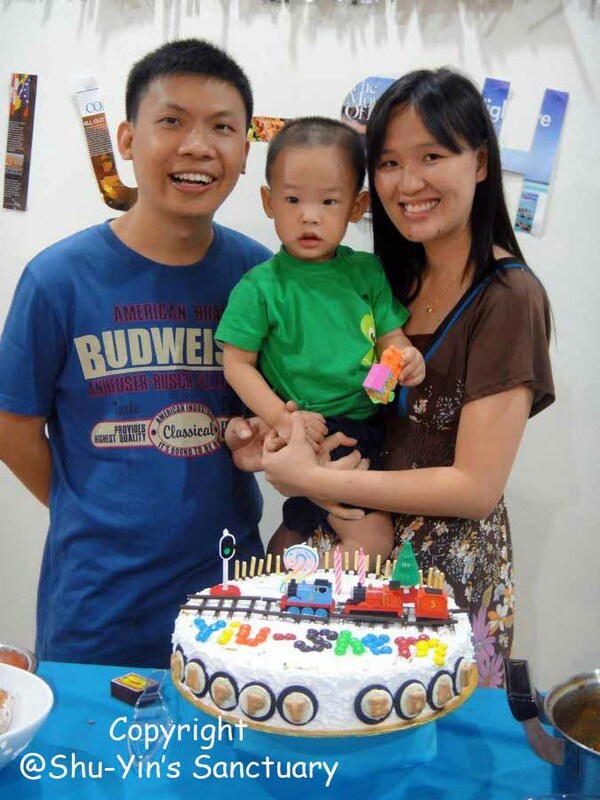 How I glad i got such a mummy but you are really keng....salute!